Even though they look brown (which they are, but only because I won’t use food dye) these are indeed red velvet cupcakes with cream cheese frosting- (CLICK HERE for recipe). These are amazing to take to office parties or any event where people might have varied diets. These cupcakes are safe for those with gluten allergies or celiacs disease, vegetarians and vegans, (if using carob) safe for those allergic to chocolate, low fat, and low calorie (compared to most cupcakes)! Whoa! Not many recipes I know of are so socially friendly, so make a batch and take them to your next office party, but you better save a few at home, you might not get any! In a large bowl, mix all of your dry ingredients together, if needed sift them to prevent lumps. Set aside. In a smaller bowl or a blender (which I did), blend all your wet ingredients. A blender works best to prevent clumps of banana/applesauce. Blend until smooth and reserve until ready to bake cupcakes. It is important to not mix your dry and wet ingredients together until just before you fill the muffin tins, so get them out and line with paper cups or liberally spray with nonstick spray (make sure its gluten free). When your oven is preheated and you’re all ready, Mix the wet into the dry until the lumps are gone. Fill muffin tin to desired levels: full makes about 14 cupcakes with big muffin tops, 3/4 makes 16-18 with just a little top, 1/2 way makes 20-24 cupcakes with no top. Bake in the middle rack for 20-25 minutes or until a toothpick inserted in the middle comes out clean. If you’re going to frost them let cool completely first or frosting will run. 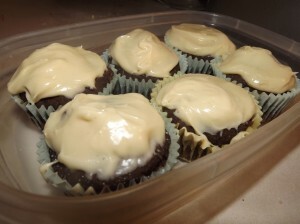 For our frosting recipe please click HERE. PLEASE TAKE NOTE: If you are making this and cooking for someone with gluten allergies or celiacs disease. Make sure to purchase ingredients that are certified gluten free, and clean your utensils very well. Better safe than sorry. This recipe is safe for those on a gluten free diet, vegan diet, low fat diet, low calorie diet, and if used, chocolate free diet. This is a great recipe to bring to a party, safe for almost everyone! Lately I’ve been dabbling in gluten free cooking, however if you’ve ever looked at all purpose gluten free flour mix, you’ll know it costs a small fortune. While this still isn’t super cheap, its much cheaper than premixed flour. Mix well and store in airtight container. 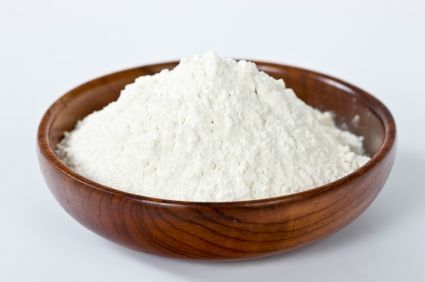 You can use this instead of wheat flour in most recipes. Works especially well for pancakes and cupcakes! Is vegan/vegetarian and gluten free.